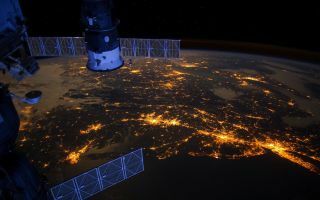 An Expedition 30 crew member aboard the International Space Station took this nighttime photograph of much of the Atlantic coast of the United States. An Expedition 30 crew member aboard the International Space Station took this nighttime photograph of much of the Atlantic coast of the United States in this amazing space wallpaper. Large metropolitan areas and other easily recognizable sites from the Virginia/Maryland/Washington, D.C. area are visible in the image that spans almost to Rhode Island. Boston is just out of frame at right. Long Island and the New York City area are visible in the lower right quadrant. Philadelphia and Pittsburgh are near the center. Parts of two Russian vehicles parked at the orbital outpost are seen in left foreground. This image was taken on Feb. 6, 2012.